Ideas for scrap booking projects, new techniques and product review and usages! Recently, I signed up for a group on Facebook called Play Along, which offers a bunch of challenges. Some are for prizes, some for fun, some have deadlines and others are open-ended. It all started out because of YouTube! A couple of weeks ago when I was home, sitting on the couch, I looked to YouTube for inspiration. I came across this YouTube channel called My Sister’s Scrapper. Ginger, the woman running the channel, was making these paper bag mini albums. So, I thought, I could do this once I get better and get back to my craft room. And, that’s as far as I got! Until the other day. I also subscribe to a blog written by a woman named Janis. Her blog is Pause Dream Enjoy. I found her blog from a YouTube channel that I follow called CardzTV. Anyway, in this blog was a link to the Facebook page and on that page was the challenge to make one of the Paper Bag mini albums. I figured that since I saw the challenge, I should at least attempt to make one. So I did. I went through my house and gathered up the necessary items and then started watching all the parts to her videos. Her directions are so clear and precise – I was amazed that even I could follow them!! 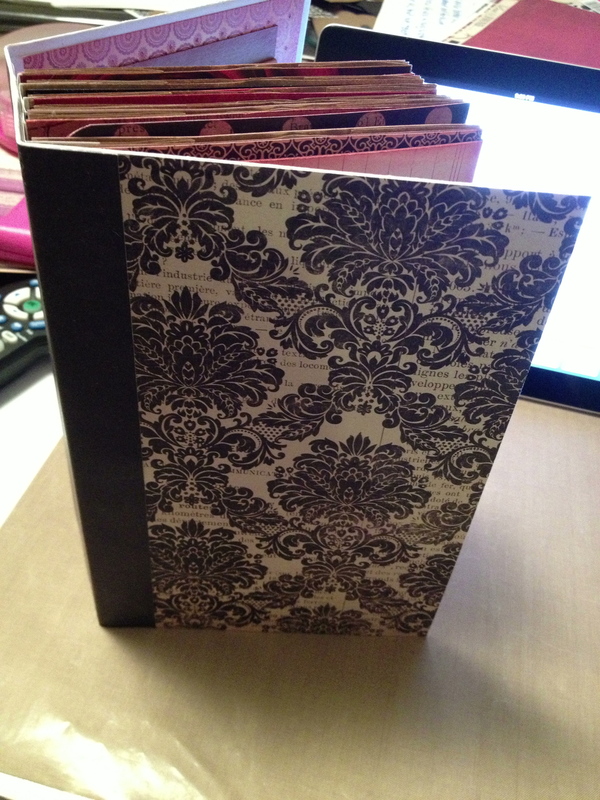 It does take a while to construct the basic form of the album, but I was really impressed with how mine turned out. I have a few things to keep in mind for the next one, but the simple fact that I said I will make a “next one” shows you how easy it was to follow along with the videos. Just a couple of tips if you are going to play along. Janis says that the albums take a lot of paper and they do. I used a My Mind’s Eye paper pack called Lost & Found. I also supplemented with some plain colored card stock that I embossed (both dry and powder) or used punches to add decorations to, as well as some coordinating card stock. She also suggests that you go through your paper pack (if you are using one) and pick the cover paper first. That way, you don’t use those pages on something else. The cover is one of the last things you will do. 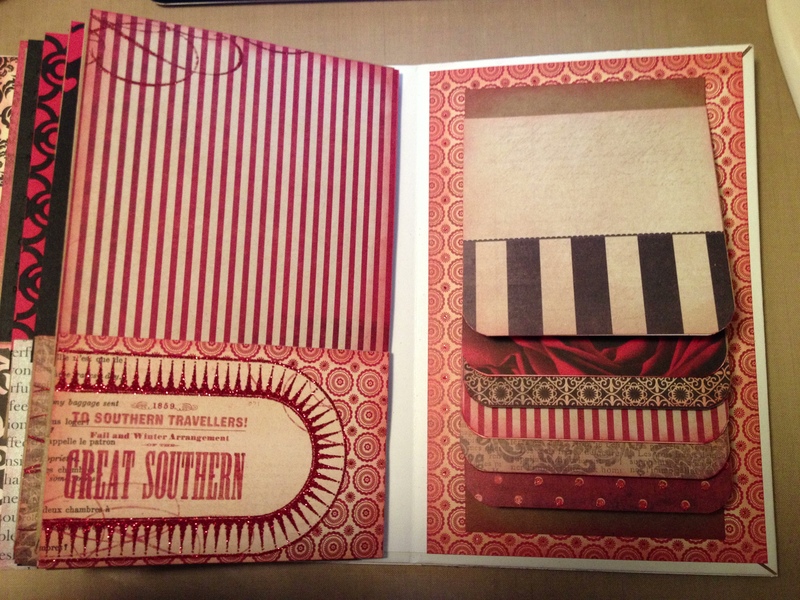 Here are some pictures of what my paper bag mini album looks like so far. I have a lot more to do – make tags for inside the top of the paper bag part and tags for the pockets inside and work on the embellishment parts of the album. I’m not sure if this is going to go up on Etsy or not. SInce it’s the first one I’ve done, I am not sure if I want to keep it or not. Let me know what you think. 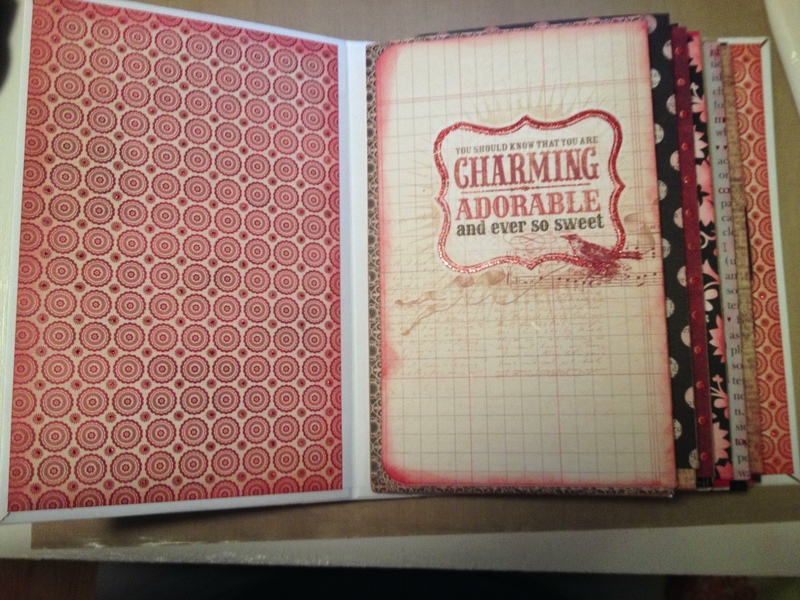 Thanks for stopping by and checking out my paper bag mini album. Once I finish this, I will post an update with more pictures. I am hoping to work on it this weekend, so hopefully you will be able to see the finished product soon. Feel free to leave a comment and subscribe! Posted in Uncategorized and tagged card stock, embossing, Etsy, My Mind's Eye Lost & Found paper pack, Paper bag mini album, paper bags, Play Along Facebook group challenge, pockets, punches, tags, waterfall feature. Bookmark the permalink. Michele, the album looks awesome so far! Thanks Erin! Can’t wait to finish it. It was so much fun to make! That is really cute! I love the color scheme. Thanks Angela! I am really happy with the way it is coming together so far! Back at it – New Sketch Sunday! Did you ever have one of those days…..